The sun is a hot sphere of gas whose internal temperatures reach over 20 million kelvin due to nuclear fusion reactions at the sun's core which convert hydrogen to helium. The radiation from the inner core is not visible since it is strongly absorbed by a layer of hydrogen atoms closer to the sun's surface. Heat is transferred through this layer by convection1. The surface of the sun, called the photosphere, is at a temperature of about 6000K and closely approximates a blackbody (see graph). For simplicity, the 6000 K spectrum is commonly used in detailed balance calculations but temperatures of 5762 ± 50 K 2 and 5730 ± 90 K3 have also been proposed as a more accurate fit to the sun's spectrum. Astronomers use 5778 K when classifying the sun as a star. For consistency in this site we use the approximation of 5800 K.
Using the equation above, and a temperature of 5800 K, gives a surface luminosity of Hsun = 64 x 106 W/m2. The total power emitted by the sun is calculated by multiplying the emitted power density by the surface area of the sun. The sun has a radius of 695 x 106 m 4 giving a surface area of 6.07 x 1018 m2. Thus the total power output of the sun is 64 x 10 times 6.09 x 1018 m2, which is equal to 3.9 x 1026 watts. Clearly an enormous amount of power when we consider that the entire world’s energy usage is only 16 TW. 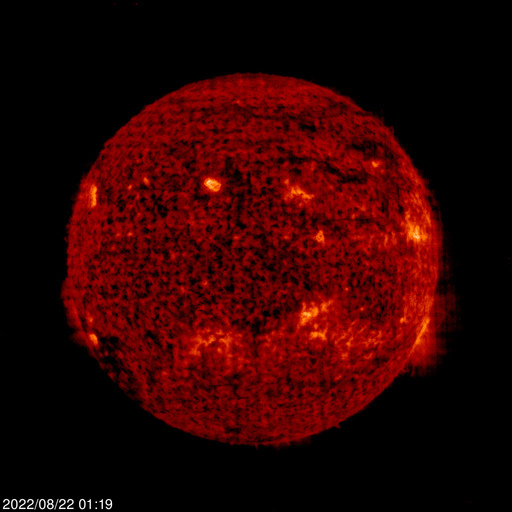 Current image of the sun (updated every few hours) from SOHO. The total power emitted from the sun is composed not of a single wavelength, but is composed of many wavelengths and therefore appears white or yellow to the human eye. These different wavelengths can be seen by passing light through a prism, or water droplets in the case of a rainbow. Different wavelengths show up as different colours, but not all the wavelengths can be seen since some are "invisible" to the human eye. 1. S. M. Hanasoge, Duvall, T. L., and Sreenivasan, K. R., “From the Cover: Anomalously weak solar convection”, Proceedings of the National Academy of Sciences, vol. 109, no. 30, pp. 11928 - 11932, 2012. 2. C. E. Backus, Solar Cells. New York: IEEE, 1976, p. 512. 3. J. E. Parrott, “Choice of an equivalent black body solar temperature”, Solar Energy, vol. 51, pp. 195 - 195, 1993. 4. M. Emilio, Kuhn, J. R., Bush, R. I., and Scholl, I. F., “MEASURING THE SOLAR RADIUS FROM SPACE DURING THE 2003 AND 2006 MERCURY TRANSITS”, The Astrophysical Journal, vol. 750, no. 2, p. 135, 2012.